‘Let’s keep the Kite Festival flying high!’ is the call in St Annes. Efforts are being stepped up to ensure the future of the rapidly-growing international event after at least 80,000 turned out for its seventh annual staging. Kite fliers from New Zealand, the US and Singapore as well as the Kuwaiti national team were among those involved this year, while Friday night’s second annual Night Fly, ahead of a full weekend of activities, alone attracted some 20,000 people. 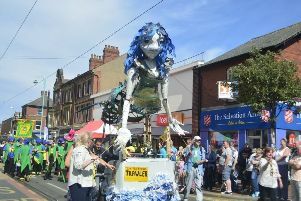 The volunteer organisers, plagued by funding issues, had to cover most of the £24,000 cost of staging the festival themselves this year and made pleas for donations during the event to help ensure it will be back next year. While civic and traders’ chiefs issued a rallying call for support, Fylde MP Mark Menzies has pledged to do all he can to help. He said: “It is now important to ensure the festival not only continues but goes on to the next level. “I will be talking to the organisers and Government trade contacts to look into future funding and sponsorship for the event.